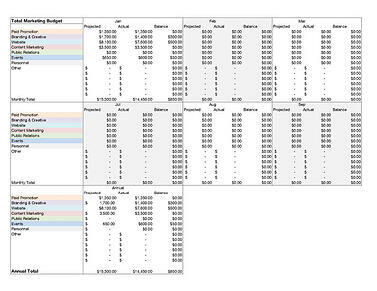 Marketing budgets are a breeze with this easy-to-use template. Use it to plan and track your marketing efforts. This free template includes a budget summary and monthly tracker for paid promos, branding and creative, website, content, PR, events and personnel costs. Consider marketing activities across seven different categories. Track actual spends against budget to reveal opportunities. Accurately project budget needs to accomplish your club's business goals.